First and only meeting of the regular season … 16th all-time meeting … the Silvertips have won back-to-back meetings in downtown Everett … the Tips are 4-1-0-0 against teams from the Central Division … Red Deer took a 4-3 overtime defeat last night in Spokane, in their first matchup against a team from the U.S. Division … the Tips have won five of the last six games … tonight is the final game of a four-game homestand (2-1-0-0). 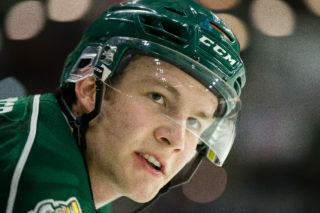 EVT 5 – POR 0 (2-9-19): Silvertips defenseman Jake Christiansen recorded the first hat trick of his WHL career, the first defenseman to ever record a hat trick in franchise history, while goaltender Dustin Wolf delivered a 29-save shutout, his sixth of the season, as the Everett Silvertips cruised past the Portland Winterhawks, 5-0, before 7,117 fans on Star Wars Night at A.O.T.W. Arena on Saturday night in U.S. Division action. 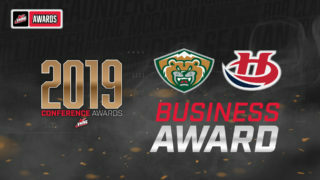 For the 16th straight season, the Silvertips are headed to the playoffs, as they become the first team in the Western Conference to clinch a playoff birth after handing the Winterhawks their first shutout loss of the season. 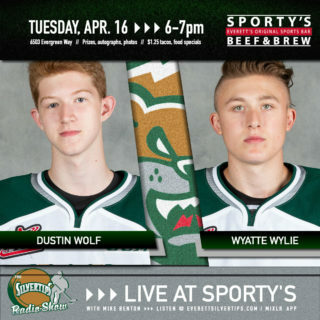 Wolf’s shutout was the 10th of his career, moving into a fourth place tie on the Silvertips all-time list with Austin Lotz. 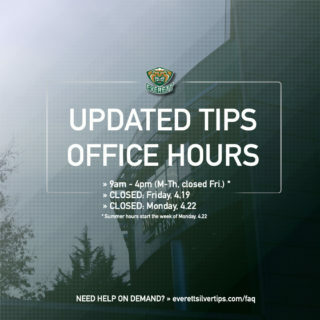 ON THIS DATE: FEB. 14, 2006: The Tips also won on Valentine’s Day, 13 years ago … behind four goals in the third period, the Tips rallied after trailing 1-0 through two periods to defeat the Seattle Thunderbirds, 4-2 before 5,589 fans in downtown Everett … Leland Irving stopped 26 shots in net … Ondrej Fiala, John Lammers, Brady Calla (game winner), and Peter Mueller (empty net) also scored for the Tips to move to 3-3-0-1 in the season series with the Thunderbirds. 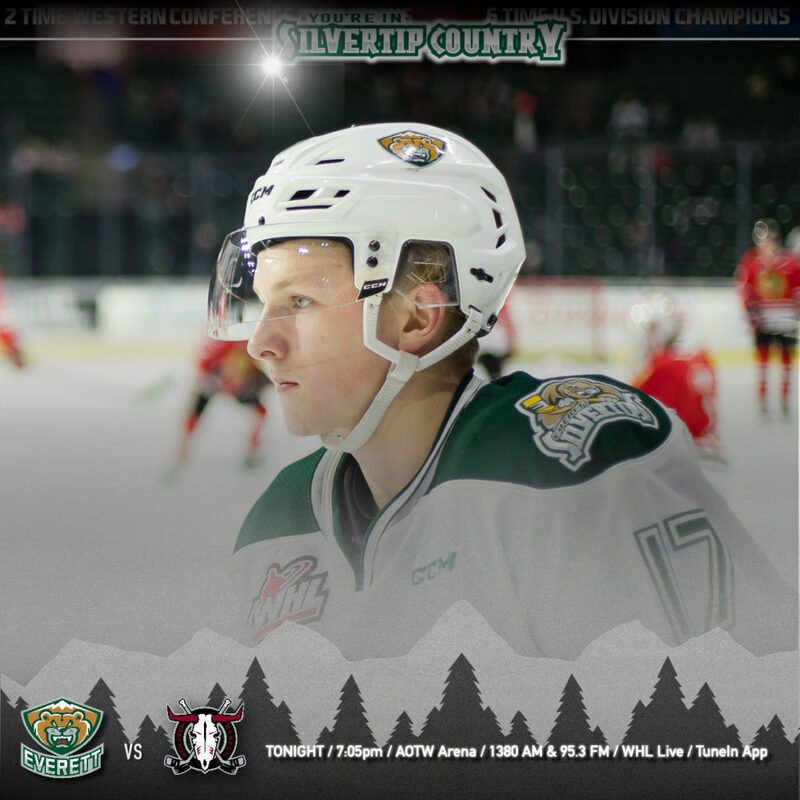 HATS OFF TO THE TIPS: The Silvertips have earned hat tricks in four of the last five games … Jake Christiansen became the first defenseman in Tips history to earn a hat trick, Feb. 9 vs. Portland (5-0 win) … Connor Dewar, Bryce Kindopp and Zack Andrusiak had hat tricks in the prior games. 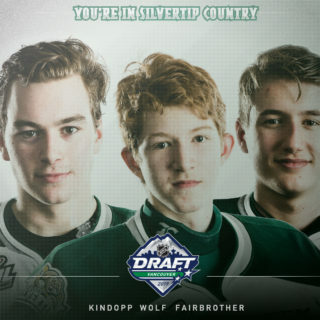 OPEN THE FLOODGATES: After enduring a three game losing skid where they scored four goals, the Silvertips rebounded to now win four of the last give games, scoring 28 goals in that span. PITBULL IS TOP DOG: Tips captain Connor Dewar comes off of WHL Player of the Week honors, announced Feb. 4 … his 72 points are 10th in WHL scoring and 34 goals are one behind teammate Zack Andrusiak. LISTEN » KRKO 1380 AM & 95.3 FM GET TICKETS NOW » Still available!